This post contains affiliate links. See my full disclosure page here. I knew I didn’t want to be located right on Waikiki Beach this trip. There are so many things to do in Oahu with kids. Our plan was to be out an about every day rather than relaxing at Waikiki Beach. Instead, I wanted to stay somewhere where we could easily walk to restaurants and shopping. And that would be easy to drive in and out of. Oh and didn’t feel dated. That’s when I found the Waikiki Courtyard Marriott! 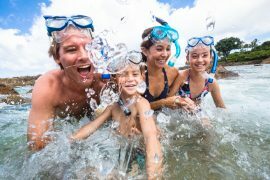 What you’ll notice when you are looking for the best Hotels in Waikiki for families is that some are brand new and some are very old. The Courtyard by Marriott Waikiki Beach was recently renovated. This $20 million updated 403 rooms, including 95 suites that are perfect for families in Waikiki. Take a look at what their “Island Chic” hotel looks like in the urban oasis in the heart of Waikiki. Since I was traveling with my mom, my preschooler, and my toddler, we reserved a Deluxe Double Double guest room. We also had a pack-n-play reserved. We’ve discovered when traveling with kids in Hawaii, they prefer to co-sleep with an adult. So, my mom took one kid and I took the other. We were impressed how comfortable the beds were. They are pillow-top beds. The pillows are also very comfortable. I had my preschooler use the small pillow and it was perfect for him! Some of the best hotels in Waikiki for families feature a kitchen. Waikiki Courtyard Marriott is no exception. 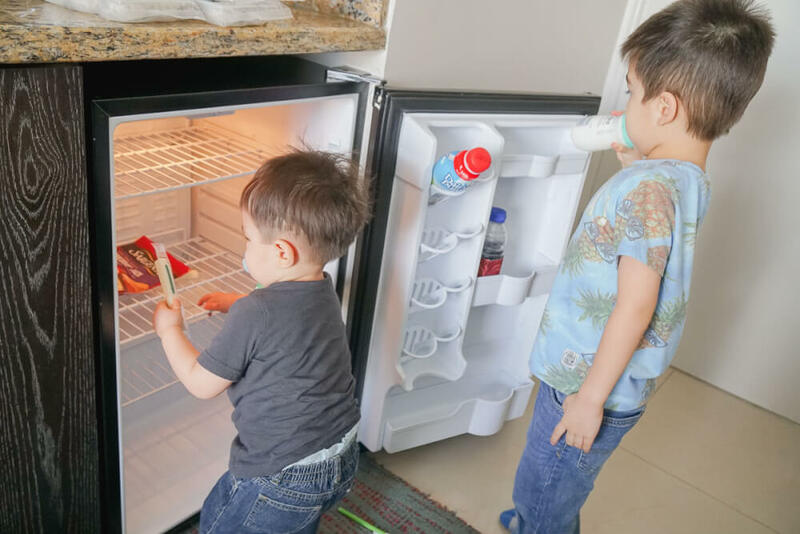 When you are traveling to Hawaii with kids, having a mini fridge is so helpful. We stocked it with milk and string cheese as soon as we arrived. Throughout our stay, we filled it with restaurant leftovers. This saved us a lot of money in Hawaii with kids since we could eat in the hotel room. We also appreciated that the Courtyard by Marriott Waikiki Beach had a sink in their kitchen area. It was perfect for washing out my toddler’s sippy cup in between uses. Plus, it made it easy to rinse off utensils and cups to reuse later in our trip. 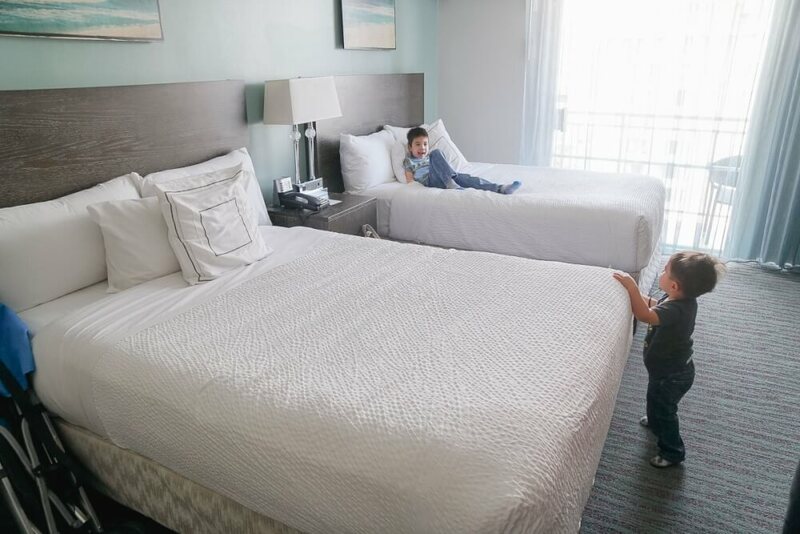 For our family, the Deluxe Double Double guest room was the perfect size for our family. My toddler was able to push the rolling chair around the room. And his stroller. And our luggage. The bathroom was also quite large. As a mom of two little kids, I’m used to them following me everywhere. The bathroom is no exception, so I appreciated the extra space. The only place that wasn’t roomy was the shower itself. So, you know how I said the Courtyard by Marriott Waikiki Beach is a few blocks from the ocean? That doesn’t mean it doesn’t have a view. It’s just more of a city view, which is exactly what my kids were interested in. My preschooler loved to be able to scope out the pool in the morning. My toddler was quick to point out all the tour buses. And one morning, the boys watched the tiniest garbage truck empty bins on a side street. For families with little boys, you understand what a cool view this is! 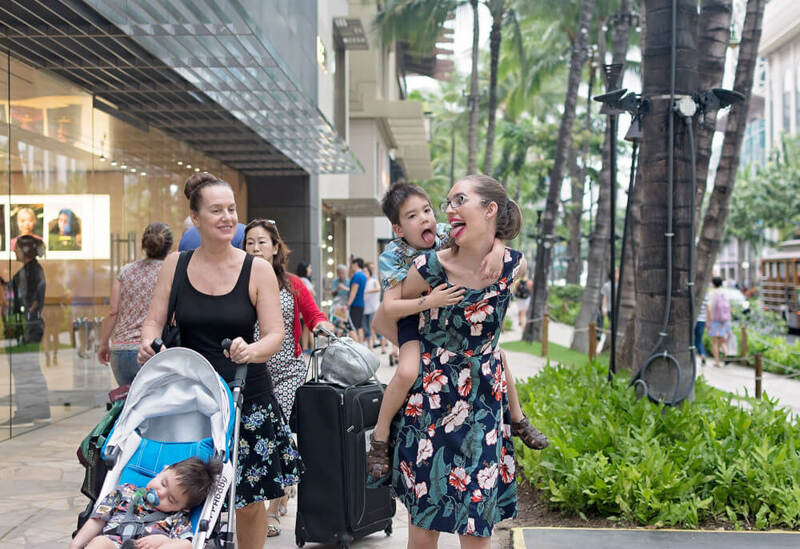 I’ve stayed in Waikiki a handful of times without kids. Usually we are on the beach or across the street. 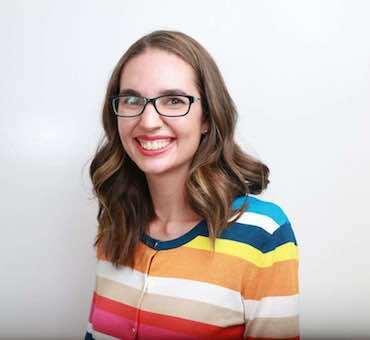 While that’s super fun when it’s just adults, it can be a bit overwhelming for families with small children. 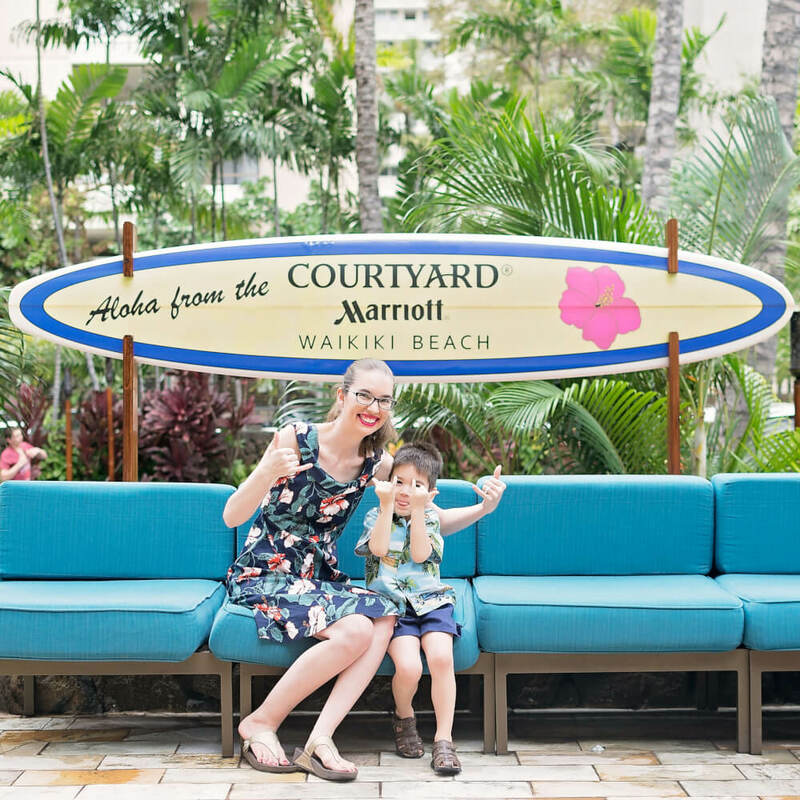 The Courtyard by Marriott Waikiki Beach is one of the best hotels for families because it’s NEAR Waikiki Beach without being on the beach itself. It’s next to an ABC Store, Whaler’s General Store and it’s a 5 minute walk to the popular Waikiki Beach Walk. We also were able to easily walk to the famous Duke Kahanamoku statue, the Royal Hawaiian Center, and the new International Market Place. Do your kids like watching movies? How about watching movies while swimming in Hawaii? The Courtyard Waikiki Beach has “Dive In” movies playing at the pool! When we were there, the movie was Disney’s Moana. 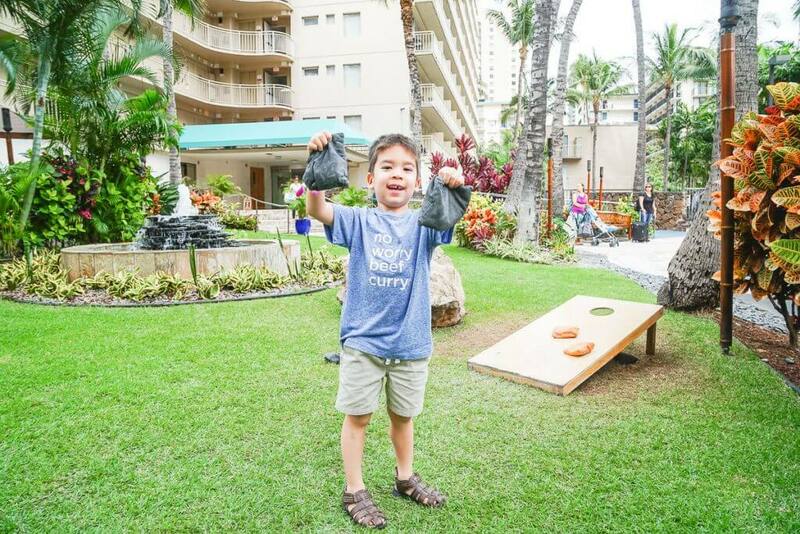 They also have corn hole set up in the front lawn at the Courtyard by Marriott Waikiki Beach. My son had fun tossing the bean bags when we got back to the hotel. It helped refocus his energy. 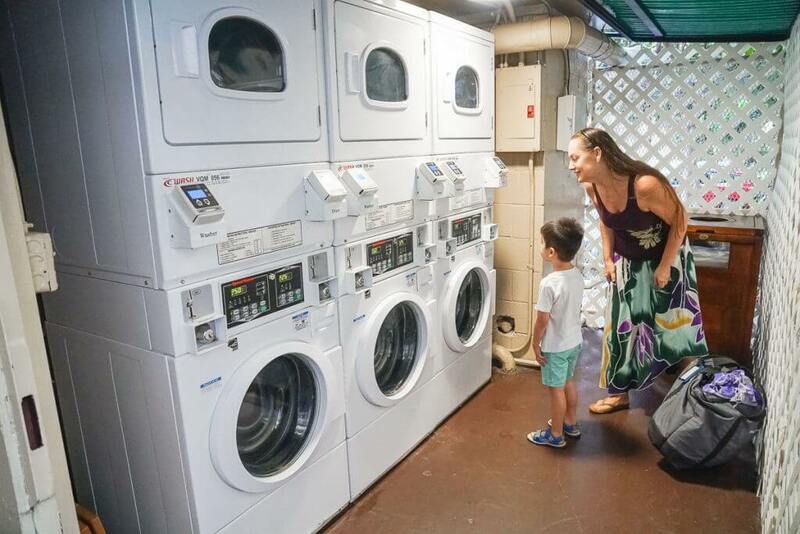 It’s unusual perks like this that make it a best place to stay in Waikiki for families. 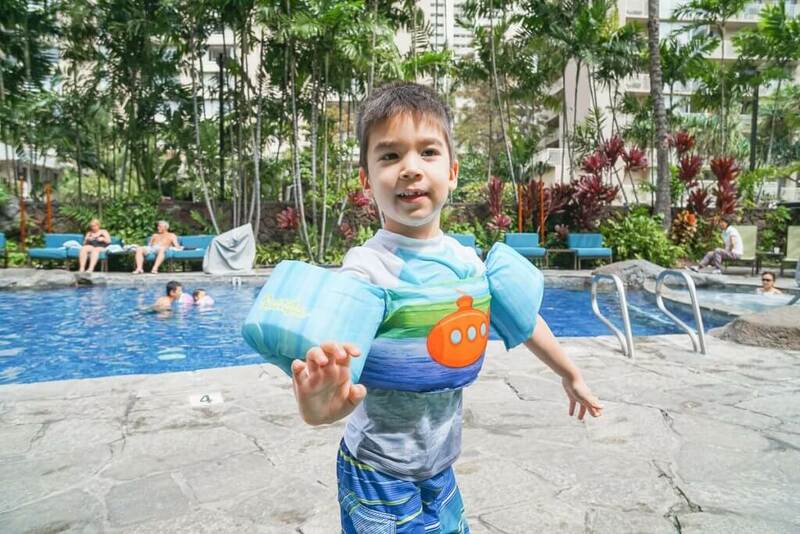 For most kids, the pool is their favorite part of staying at a hotel on a Hawaii family vacation. My son is no different. The Courtyard Waikiki Beach has a modest pool and hot tub. The area is very quiet. We stayed here during the week and I think many of the guests were here on business, so the pool area wasn’t crowded during the afternoon. The hot tub was the perfect way to relax after exploring Waikiki with kids. They also have comfortable pool chairs. Plus, you can grab a cocktail at the Lobby Bar for yourself. And head to the Market for a frozen treat for your kids! My boys are always hungry. Like they want a snack AFTER they have inhaled their entire dinner. So, it was nice that the Courtyard by Marriott Waikiki Beach has an array of food options available in their lobby. Plus, there’s a microwave. 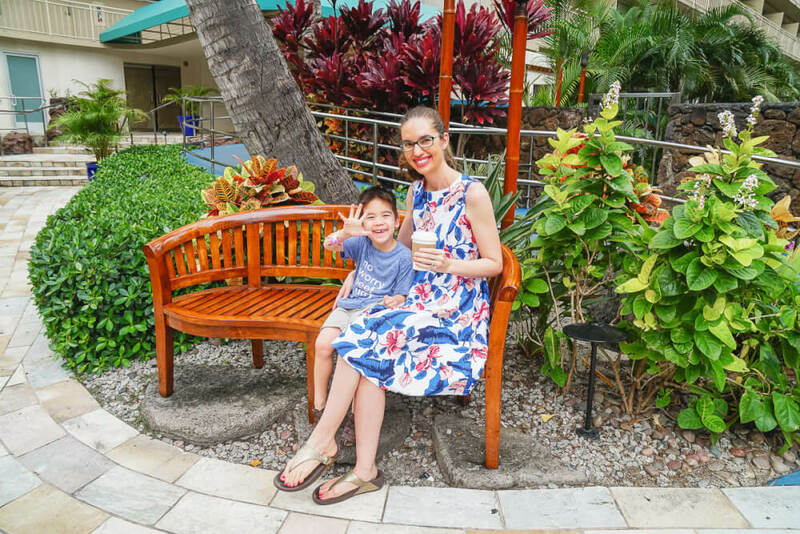 It’s a great option for families who want to grab snacks for the road while heading up to the Polynesian Cultural Center, Hanauma Bay or Pearl Harbor. On the other side of the Market is their business center. Just ask the front desk for the password and you can use their computers and printers. This was perfect for printing off a waiver I needed to bring with me to Aulani later that week. I need a latte every morning. No, the hotel coffee just doesn’t cut it for me. I need a coffee drink with lots of milk and sugar to kick off my day in Hawaii with kids. 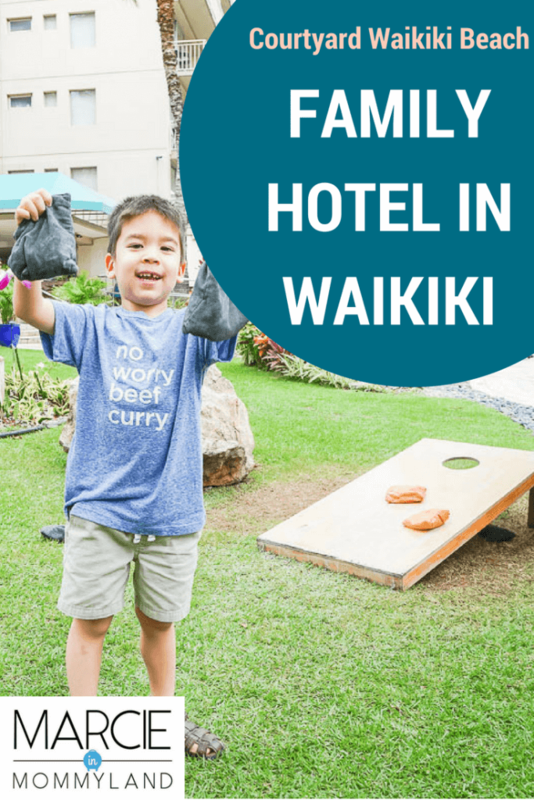 This is a main criteria for my picks of the best hotels in Waikiki for families! 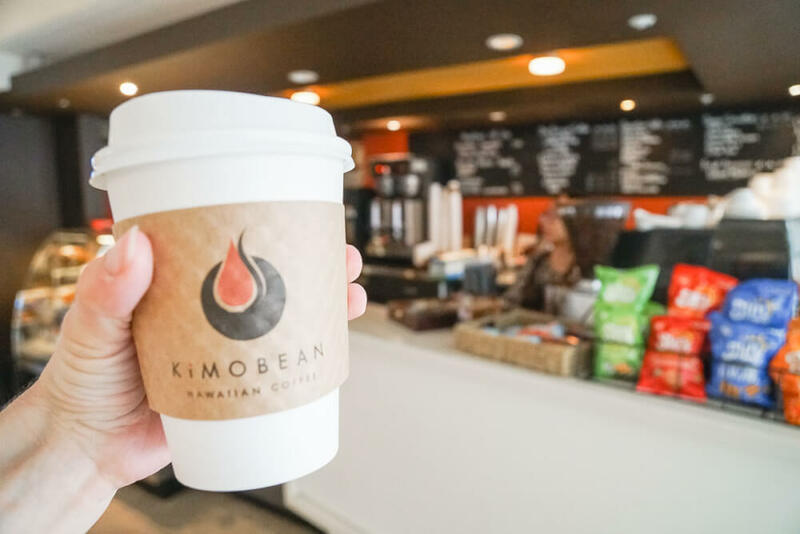 Not only does KiMOBEAN Hawaiian Coffee have an array of coffee and tea drinks, but they also have breakfast items. I was mostly impressed that they offered musubi, which is a family favorite. Perfect spot for a light breakfast before hitting the road. If you don’t want to pack a ton of clothes on your Hawaii family vacation, you don’t have to. The Courtyard by Marriott Waikiki Beach has laundry services on the other side of the parking lot. This came in handy for our family after my kids had a few accidents. I hate traveling with smelly clothes. Something that’s extra cool about the laundry at Courtyard Waikiki Beach is that you can track it on your phone. We found that we did the wash cycle one time, but needed to do the dry cycle a few times. No one else used these facilities while we were here. We actually walked to get some Spam musubi while our clothes were being washed! 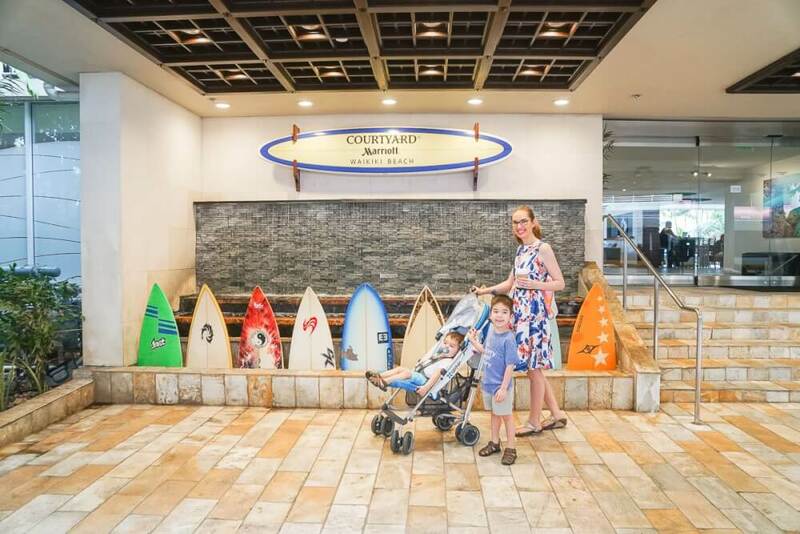 Another reason this is one of the best hotels in Waikiki for families is their valet service. It’s so fast! No one likes to wait for their car. They brought our minivan around in under 5 minutes every single time. The valet/bell services employees were so nice! One of them let my toddler roll our suitcase all the way from our hotel room to the valet area. He made sure my son wouldn’t fall over and chatted with my preschooler the whole time. Top notch employees like this is why the Courtyard Waikiki Beach is my pick for the best place to stay in Waikiki for families. 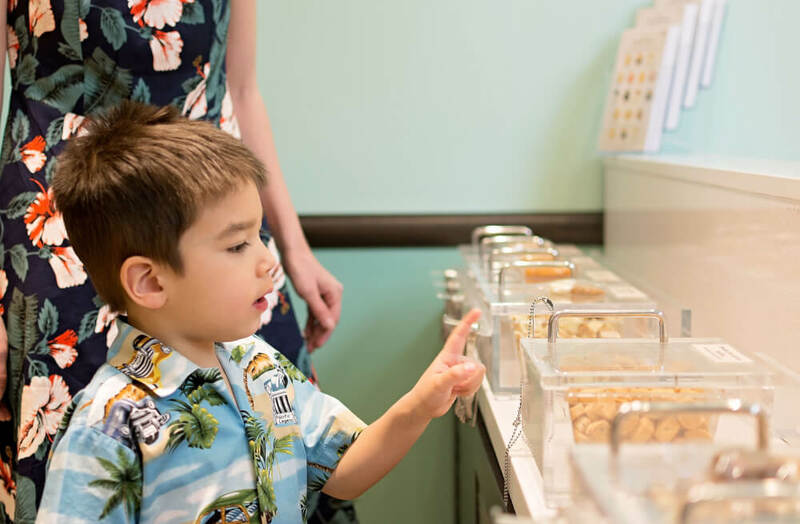 I recommend taking the kids to the Honolulu Cookie Company location at Waikiki Beach Walk. It was recently expanded and it’s one of their larger stores in Waikiki. They offer mini cookies as free samples. It’s surely to be a hit with kids! Plus, Honolulu Cookie Company is a great stop for grabbing gifts. We purchased a few gift boxes to bring back to my son’s preschool teachers. Since their cookies are individually wrapped, they are perfect for bringing to school or work. And they make a fun treat in a lunch box. Oh, did I mention the cookies are adorably shaped like pineapples? One of the newest, most authentic luaus on Oahu is Toa Luau in Waimea Valley. It just launched in October 2017 and my family attended it’s 17th show. I’d say this is definitely one of my top things to do in Oahu with kids! 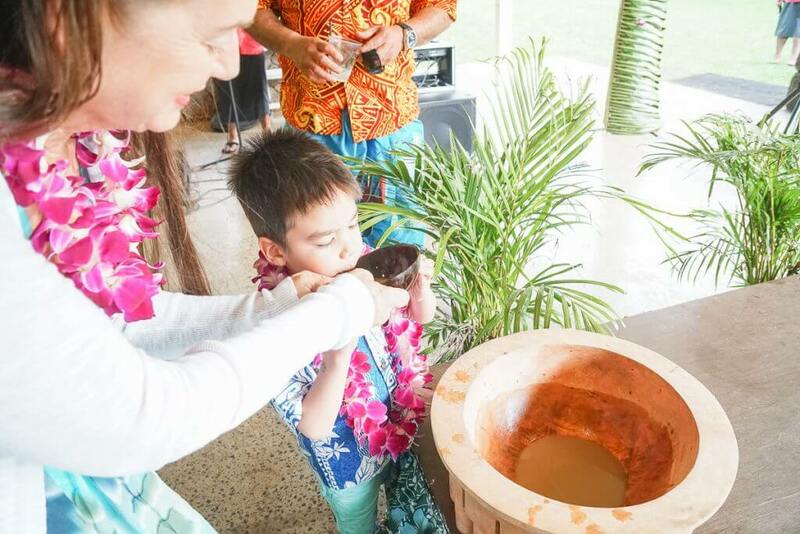 Toa Luau offers hands on activities, a Kava ceremony, coconut tree climbing, food and a Polynesian show. It’s family-owned and operated. They have a focus on Samoan culture in addition to several other Polynesian cultures, including Hawaiian. I loved this activity so much that I wrote an entire blog post about Toa Luau! I got a great tip from an Oahu local to swing by Musubi Cafe Iyasume on Seaside Ave in Waikiki. She told me it was a tiny shop that usually has a line out the door. Boy, she wasn’t kidding! This location is about the size of my closet and there’s really only room for maybe 3 people max inside. But, it’s one of my top places to eat in Waikiki with kids! It’s take-out only, but they have a few chairs outside if you want to sit and eat. 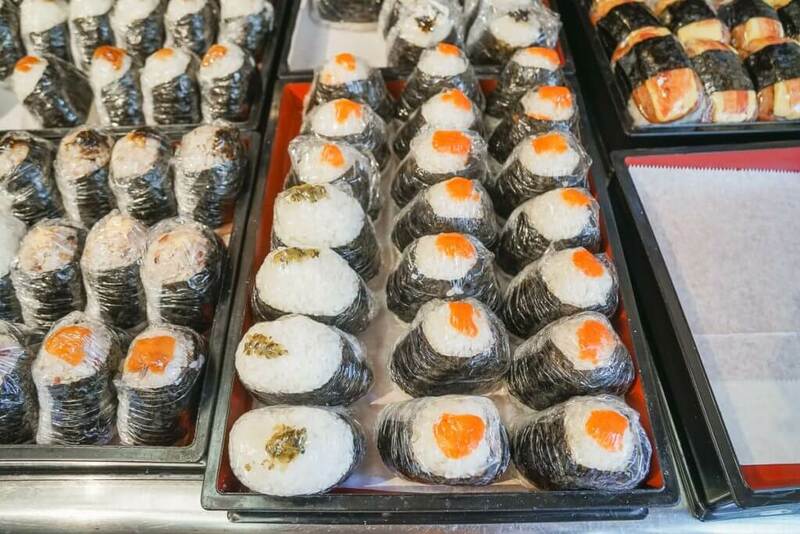 Musubi Cafe Iyasume offers all kinds of musubi (including Hawaiian Spam musubi,) bento boxes, poke bowls, and rice balls. It’s perfect grab and go food! We actually stopped in again on our way to the airport so we’d have yummy food to eat on the plane! 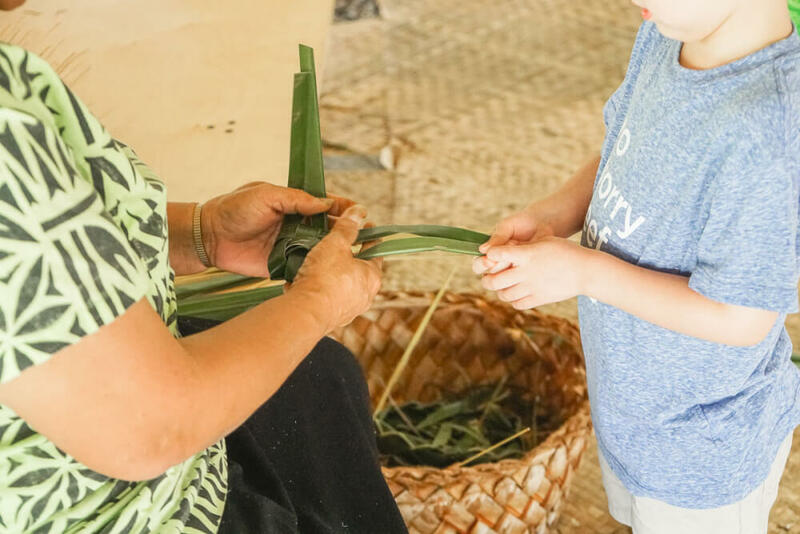 If you are looking for things to do in Oahu with kids, the Polynesian Cultural Center is something not to be missed. It made such an impression on me when I visited as a teenager. I visited 5 years ago when I was pregnant with my son. So, it was really special to bring him to the Polynesian Cultural Center now that he’s a preschooler. What’s new at Polynesian Cultural Center is their Hukilau Market. This area features food trucks, sit down restaurants and shops and you don’t need a ticket to enter here. You do need to purchase a ticket to explore the Polynesian Cultural Center and attend their luaus and Ha: Breath of Life show. Thanks to Cindy Marie Photography for some of these photos. Check her out on Facebook and Instagram. Thanks to the Marriott by Waikiki Beach for extending me a media rate for my stay. I also received discounts to Polynesian Cultural Center, a gift from Honolulu Cookie Company and tickets to Toa Lua for review purposes. All opinions are my own. Great post with lots of information!!!! We are looking to taking our children to Hawaii! If we plan to go to Waikiki I will definitely check this hotel out! I hope you get to explore Waikiki! It’s such a festive place! This looks incredible! We just LOVE Marriott hotels! So do we! This was a good reminder to book with them more in the future! Wonderful pics! Looks like a great trip! We love the courtyard and try to book there in all of our travels! It’s a great hotel chain! I bet your boys will love Hawaii just as much as my boys! It looks like you had an amazing time. We stayed at a Marriott in Waikiki Beach last year and it was fabulous. Marriott is truly the best hotel chain we’ve ever stayed at. The customer service there was fantastic! The bathroom was so large with space enough for a suitcase to use as a private dressing area if desired. Funny though how the shower was so tiny… definitely not designed by someone who shaves his/her legs, or showers with babies! All in all, I agree Courtyard Marriott Waikiki Beach was a great choice, such friendly staff, fresh and interesting decor, and many amenities anticipating the needs of travelers, whether business people, or families traveling on vacation. I loved how it was within close walking distance of so many shops and restaurants, landmarks and the beach! So glad I got to share this trip with you! Thanks so much for coming along and helping with the kids! We’ll definitely have to go back and spend a bit more time in Waikiki and stop at Iyasume every day! 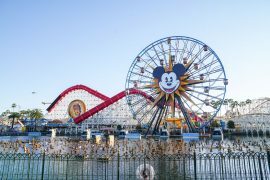 Your family is beautiful and it looks like you had so much fun! That room was quite impressive and although I am not a kid, the Cookie Company looked amazing! Thanks for sharing and glad you guys had a great time! Honolulu Cookie Company was so good that I’m writing a whole blog post just about it! Your photos are beautiful. It looks and sounds like you had a great time. I want some of that sushi! The musubi was SO tasty! Thanks for sharing! I love all of the activities for kids and the onsite laundry! That looks like a really nice hotel for a family with kids and a really nice view to boot. I’ve never stayed in a hotel that has had some many amenities available. We were definitely impressed by all the amenities! Oh Hawaii has been my favorite destination that I have ever visited! I love it in Waikiki. We havnt stayed at this place but have stopped in there a couple of times at teh internet cafe they use to have 🙂 Looked lovely for families. 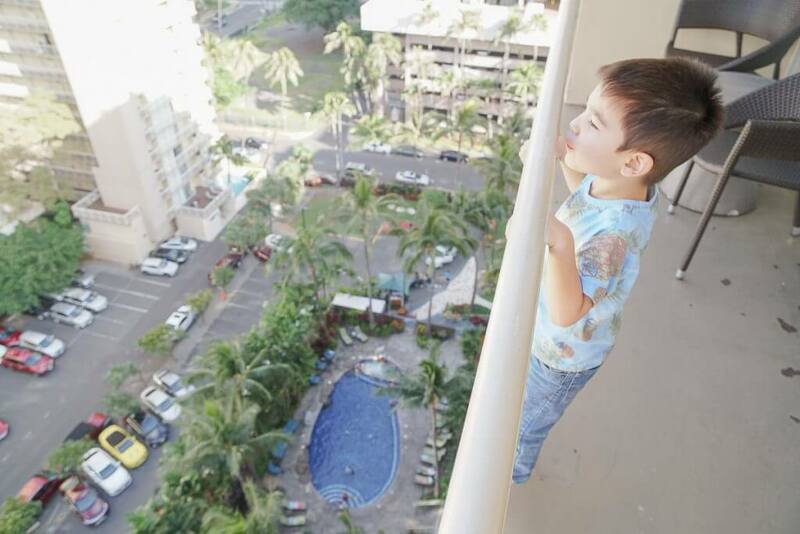 It’s a great Waikiki hotel for families, business travelers, couples and solo travelers! The warm air made us all feel so much happier! Do it! Waikiki is a great place to explore, relax, and people watch! What an amazingly fun trip you all had! I love the looks on the little guys’ faces. They will remember this for a lifetime. They had such a great time bonding together in Hawaii! This hotel look so inviting, I would absolutely consider it for a stay when visiting. It’s in a nice location, too! 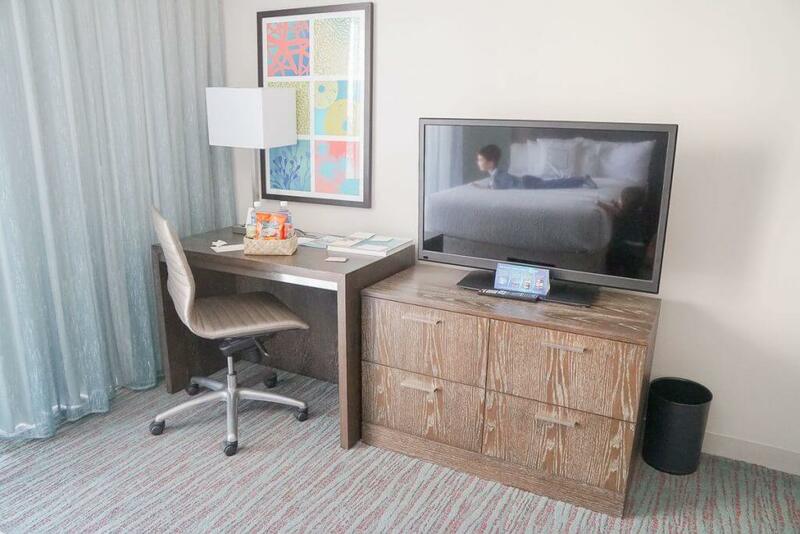 looks like the perfect place to stay & it looks like you had a great time! the kitchenette is key for me when I have my niece & nephew with me! Yes, it’s amazing how having even a small kitchen can be a lifesaver with kids! I have been looking for a family friendly hotel to take my kiddo! I love your pictures! This is a great summary of all the Marriot has to offer! We’ve been to Maui with kids but never Oahu! Someday we will make this trip, so I will refer back to this post. Looks like you had a great time! Maui is a blast, but Oahu has so many awesome places to explore with kids! It all looks so wonderful! Bringing my family to Hawaii is totally on my bucket list for family travel!! I hope you all get to go! Great review! 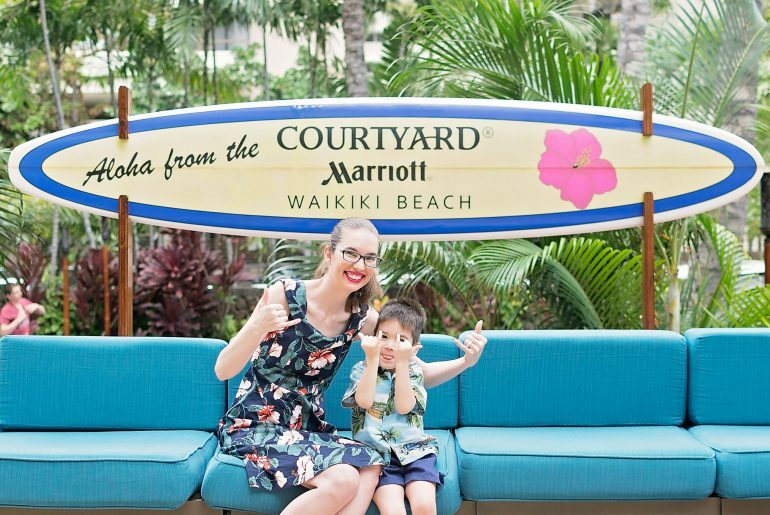 We always choose Marriott properties and this is one we haven’t been to in Hawaii yet! Thanks so much for sharing this info! I really like the quality of Marriott hotels! Everything looks so enchanting there! Hawaii is one of my dream destinations. Marriotts is a good chain, we have one here in Bangalore. Yes, you can always count on Marriott. Great to know. I’m planning a vacation to Oahu as well. Typically, we rent a home but I know we do a lot of driving because my mom loves Waikiki Beach and we love the beaches on the North Shore. Good to know that there are some hotel options for families in Waikiki. I’ve stayed in one hotel in Waikiki Beach and although the amenities were great the hotel rooms were very small which can get tiring if you’re there for a week or more. The traffic on Oahu keeps getting worse and worse. I’m learning I’d rather switch hotels mid-trip than sit in traffic for hours everyday. Plus, then I can really focus on the area we’re staying in. This looks like a great hotel for families and adult travellers too. I haven’t been to Waikiki but it looks great. Good to know it’s near the beach too! Waikiki is definitely a place to experience at least once! We loved the Polynesian Cultural Center when we were there! My dad got pulled on stage to dance and it was hilarious! It’s been like 10 years though, so I’m definitely itching to go back! Oh you should definitely go back! 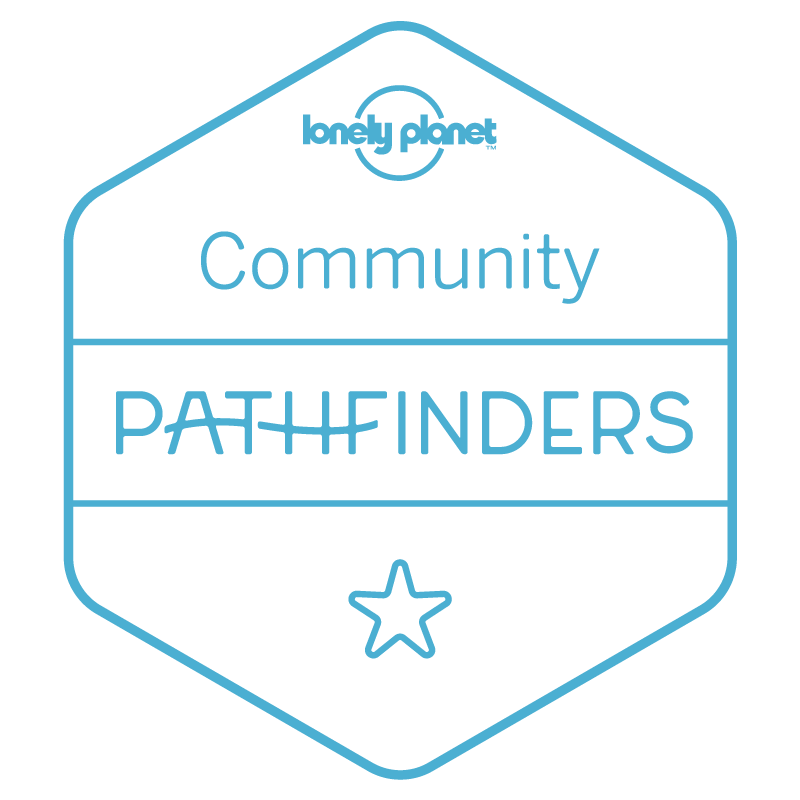 They are launching a new program this summer! This looks so fun! It would be an amazing trip for sure. I want to go there someday. I hope you get to visit Waikiki soon! Courtyard by Marriott is one of our favorite brands in their portfolio, and Waikiki Beach sounds like a fabulous property. I love the whole island chic look! I love how modern and comfortable the rooms look, and yes, a kitchenette and onsite laundry are the main reasons we stay at Courtyards 🙂 Glad you had a great stay! We had such an incredible stay! We’re ready to go back and stay longer! You certainly know how to entice us to book a trip to to Waikiki! I’m ready to pack my bags! Looks like a beautiful place to stay and a beautiful stay! Sign me up for next time! Looks like a hotel perfect for keeping kids busy. Plenty of places to watch the garbage trucks (isn’t it always funny what keeps them busy?!) and a pool. Plus walk-by snacks! And the rooms look and sound so comfortable. It really is nice when you have a kitchen space, because you can save so much money by eating the leftovers or stopping into the grocery store for yogurt and small items. Yes, it was such a convenient hotel for families staying in Waikiki! Yes, we could all use a bit of Hawaiian sunshine! This definitely seems like the perfect stay for a family! I think it’s so cool that you can track your laundry on your phone! What a brilliant idea. Looks like you all had a great time! Yeah, I hadn’t heard of the laundry tracking before! This looks like a really nice hotel! I love that there is a nice laundry area, food station, etc. It looks like the perfect stay for a family! Thanks for sharing! It was a really handy location and we loved the amenities! My friend just got back from Hawaii, and has been telling me so many stories. I’ve never been, but now more than ever, I want to go. This seems like a great place to stay. It’s such a fun place to relax and explore! Such a gorgeous hotel! I love Waikiki, such a perfect family friendly spot! It’s such a vibrant area! Perfect family hotel! Wow, looks like it has it all. The laundry facilities alone! Sharing with all my mommy friends, thank you! Yes, I’m shocked how few hotels have laundry service available! I’m completely sold on Courtyard by Marriott. It does seem like a truly family friendly hotel. The joy on the face of your kids on all those photographs do tell the story of how much your family enjoyed the stay and the overall experience. We all had such a lovely time there! 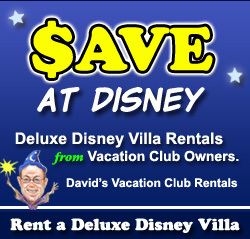 Definitely saving this for our next big family vacation! It looks like you guys had a blast! I hope you get to do a big trip to Hawaii! What an incredible property. The kids look like they had a blast. The room was the real winner for me. 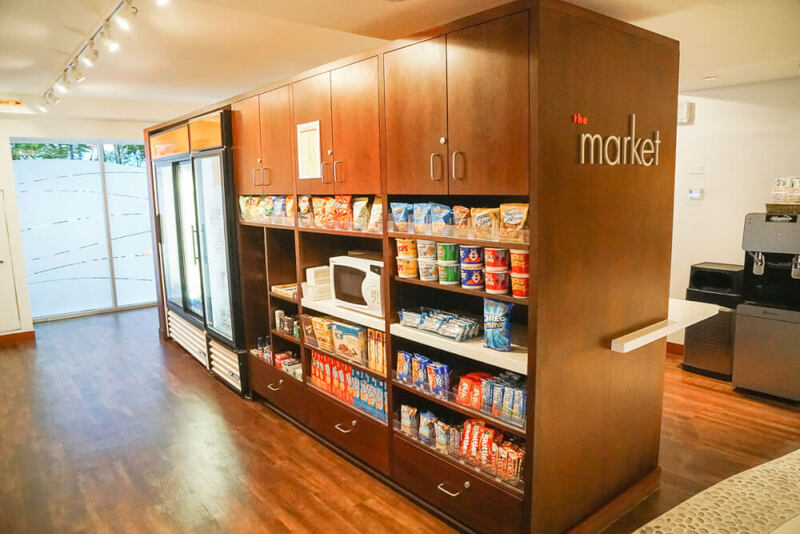 Having comfy beds and a kitchenette is a game changer, especially with families. They did a great job with the renovation! It was such a fun family vacation! We’re already talking about when we can come back with my husband! Such great information! Now being a mother and starting my family, I love knowing other mothers opinions and best options for things! Glad to help! Travel is so different with kids! look likes a grand hotel and I must say about your photographs review which showing everything about this hotel. Thanks for sharing your family trip experience because next week me too going there with family so concern about hotel review. I hope you have a wonderful trip to Waikiki!